Each year, Fat Quarter Shop has a QAL in support of a charity group. This year's quilt was Crossroads. I'm so excited to have it finished and I've been enjoying it every since! This photo shows the fabric colors more washed out that they are in true life. This photo below pre-quilting is more true to life. I quilted with organic wavy lines. I used scraps of flannel for the backing and it makes for a really nice warm and cozy quilt! I'll be linking my finish with Sew Cute Tuesdays, , Freemotion by the River, WIP Wednesday's, Let's Bee Social, Midweek Makers. Fabric Frenzy Friday, Finish it Up Friday and Finished or Not Friday. 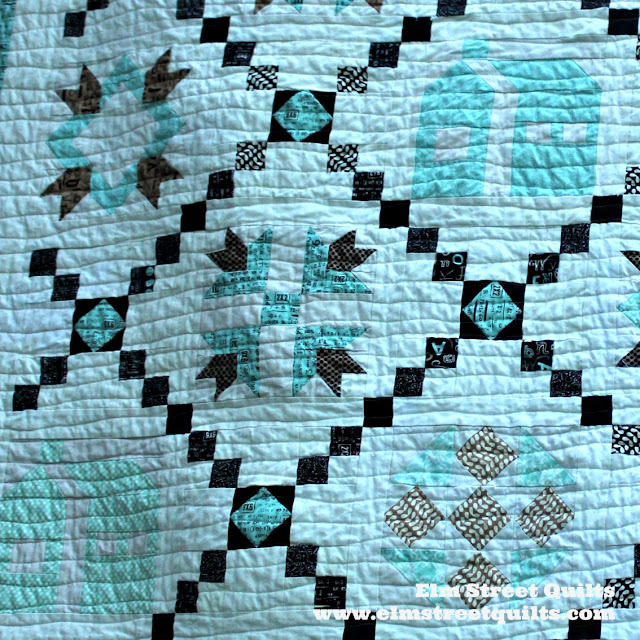 Your quilt is beautiful! Congrats on a wonderful finish! Love how this turned out. Great colours. I love your color choices, and the organic wavy lines make a nice subtle texture. 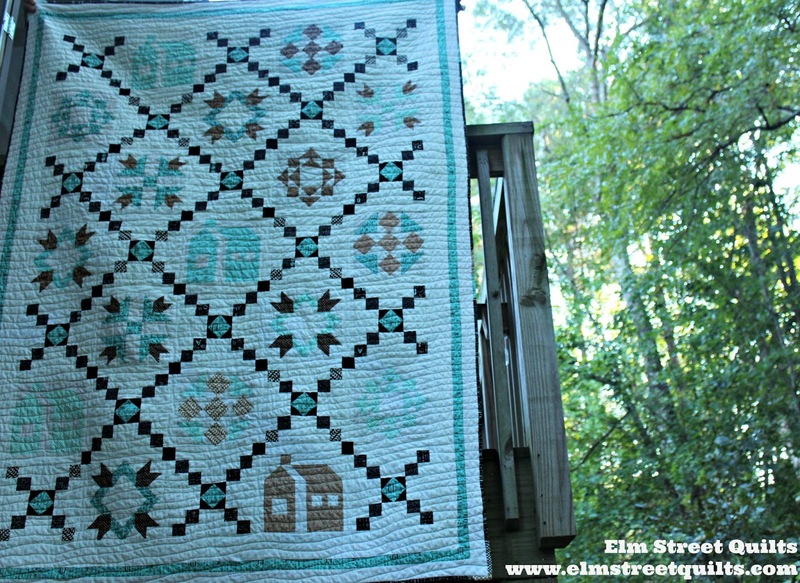 Congratulations on a beautiful quilt finish! It is inspiring me to make my quilt sandwich up, too! It's beautiful! 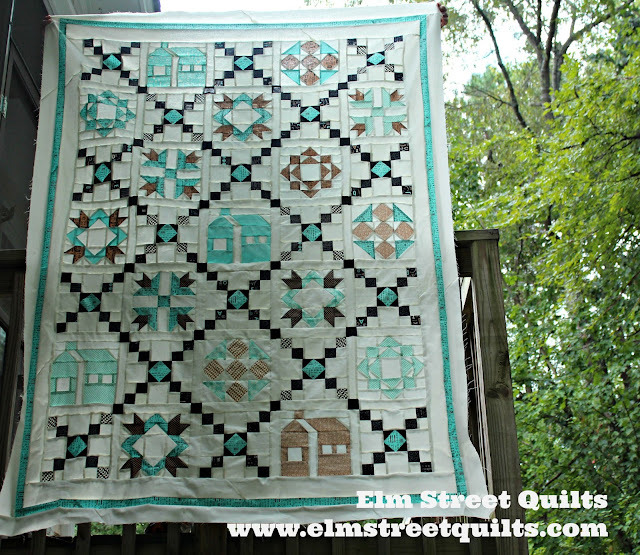 I love the setting and the way all those sampler blocks seem to float against the background. Great job! Your quilt is beautiful!!! I need to get back to mine. Very pretty! I like how the chain blocks tie it all together. Love it! and I love the organic quilting...my favorite way to quilt on my domestic! Beautiful work! Love your fabric choice ( my favorite fabric). TFS!! Fantastic quilt. I love the colors, too. You have just the right balance of blues and browns, which can be difficult to achieve. Beautiful finish! Bag It - Linkup time! The Road Home - North Carolina!